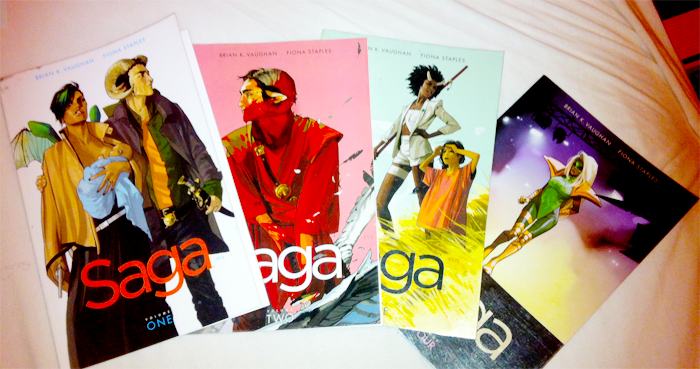 Other than clocking everyone’s rave reviews I have been staying away from the world of Saga on purpose. I have an inclination to wait for series to be near its conclusion before I pick it up. But I’m not made of stone. My friend Gina hand delivered the first eight volumes to me while we were on vacation last month. 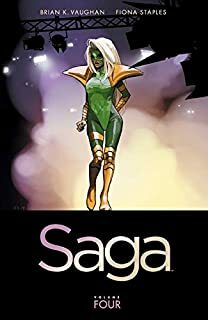 It seemed Saga’s time had arrived. These books are *fantastic*. I always knew they would be: the swath of Cannonballers who love these and have such varying taste means that they absolutely have to be the best of the best. These books are viscerally good. Cancel plans, move around to read lists, question all life choices that have kept you from reading them before now GOOD. They also transcend any entry issues I usually have with comics and graphic novels. I’m putting it down to two things, the quality of Vaughan’s narrative and the absolute stunning design of Fiona Staples. 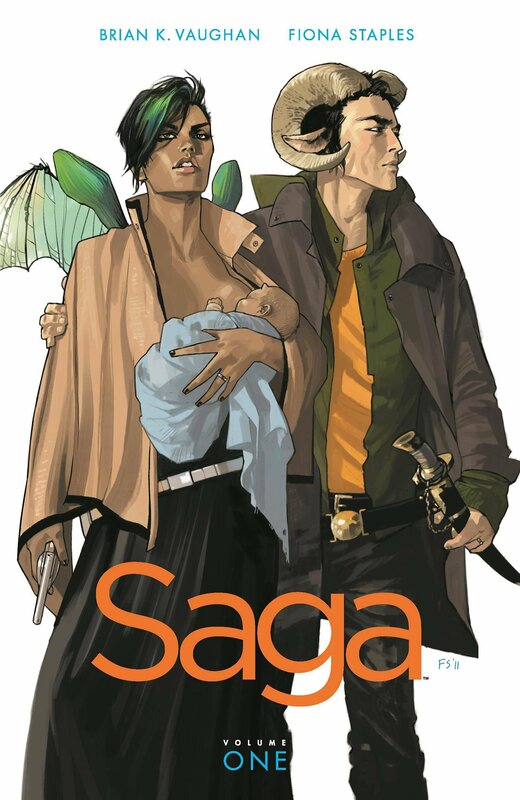 Brian K. Vaughan was introduced to Fiona Staples by a mutual friend. Vaughan reportedly chose to work with Staples because her artwork is incredible, that it doesn’t look like anyone else. I can absolutely believe it, have you seen her work? GLORIOUS. 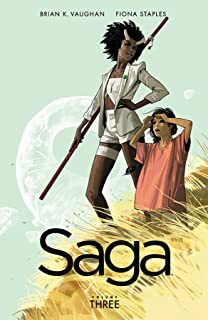 I’m so glad to know that Staples is co-owner of Saga, her work in designing the cast, the ships, and all the various races in the story is just as integral to my enjoyment of these books as the story Vaughan has plotted. Her painted covers, and hand-lettering Hazel’s narration with her own handwriting, make the difference in the quality of the books. Volume One introduces us to our family on the run and all of those who are chasing them. When two soldiers from opposite sides of a never-ending galactic war fall in love, they risk everything to bring new life into a dangerous universe. Alana and Marco are dynamic characters in very few panels; we immediately know them and their struggles even if we don’t know details yet. Their love for each other and their newborn daughter is captured on their faces in Staples’ art. There isn’t a lot of lumbering info dumps, the universe that is a scary, crazy, fucked up, violent place is easily understood and the peril facing the young family is illuminated: the antagonist characters are quickly made complex, but also frightening. Even the protagonists’ allies are visually scary, but terribly charming. I really like The Will, I don’t know what that says about me. Volume Two is my favorite thus far. It may be a perfect space opera: adventure, romance, and humor. This volume is the story of the coming together of family across planetary divides. Marko has not told his parents that he ran off with a member of the enemy, as one would expect, so he has a lot of explaining to do when they show up at their ships door. Hazel’s narration told from the future is hilarious. Marko and his mother go to find the accidentally exiled babysitter Izabel, and Alana and Marko’s father get to know each other better. Prince Robot IV is searching for the star-crossed family, The Will reluctantly joining forces with someone on the hunt for Marko broadening his character out and we get more delicious sass from The Lying Cat. I should probably tell you more about this one, but I can’t seem to find the words to break it into smaller bites, just know its good, and inextricably linked to the volumes before and after. Volume Three has my favorite of the four covers so far. It was so burned in my mind that when Gwendoline shows up in Volume Two I immediately recognized her and then became VERY confused about how we got from where we were to where we were going. Our motley crew travel to a cosmic lighthouse on the planet Quietus searching for their literary hero, the author of the romance novel that their initial courtship hinged on. This book pulls together the themes of the two previous ones and adds some of its own, as you would expect. It explores how to make a life while on the run, what finding love after a loss might look like, and how to feel about it. There’s also a bit about getting over a breakup and that violence only begets more violence. Plot-wise The Will, Lying Cat, Gwendoline, and Sophie are stuck on an idyllic alien planet while waiting for their spaceship to be repaired and Gwen is impatient to get to Alana and Marko, but the Will seems quite content to stay on the new planet. He doesn’t seem to realize that he’s seeing impossible things and they are all in danger. Meanwhile, a pair of tabloid journalists is trying to figure out exactly what is the story with Marko and Alana: could two enemy combatants actually have deserted, got married and had a child? (Yes) The real threat to Marko and Alana’s family time on Quietus is not that they betrayed their respective people, it’s that their life together might give others ideas about just who the enemies are, and that there are other options than killing them. And we learn that the opposite of war is not peace, because this is that kind of book. Volume Four is my sole four star rated volume, the other three are all five stars. I’m sure that the plot it covers was necessary for the narrative that Vaughan is after, but it was both hard to read on an emotional level, and frankly a bit uneven. In order to watch people come back together they have to be separated first, and that is not enjoyable for the characters or the readers. We’ve got toddler Hazel, Alanna and Marko struggling with the reality of life in hiding and the stresses of family, but we also have a secondary plot dealing with the Robot monarchy and rebellion that felt… off. But, even that leads to a great final panel so I can’t hate it too much. But most of all I don’t want Alana and Marko to be fighting anymore. My emotions are fragile and I love them as a team figuring it out together, not sparring with one another, no matter how true it rings. Overall, I’m in love with this series. It’s rare to have humor, sorrow, wit, action, adventure, and beautiful drawings married in one text, but this is that text. I’m making myself take a break from reading the next four volumes until at least tomorrow. I think I have the strength to hold out. These books were read as part of the charitable Cannonball Read, where we read what we want, review it how we see fit (within a few guidelines), and raise money in the name of a fallen friend for the American Cancer Society. 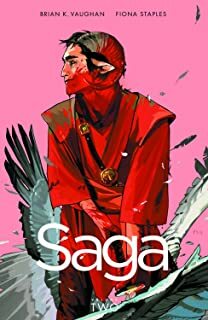 This entry was posted in Cannonball and tagged bingo, Brian K. Vaughan, Fiona Staples, graphic novel, read harder challenge.